In most cases there are always reasons for somebody who had no history of violence to commit a crime. And that is not something I would like to justify for reasons unknown to us, however, it’s an intriguing part if any of us could have had an opportunity to travel deep into the mind of one particular person, there are we sure to get our answers. I have not read Petra Hammersfahr’s novel, “THE SINNER”, and I must tell that now I am very interested in it. In her book, and from USA Network’s new series of the same name, it offers an extravagant, scary and insightful journey into the past of a young woman to find out why she had to commit that horrific act of violence that took an innocent life. Cora Tannetti (Jessica Biel) is married to Mason (Christopher Abbott) and together have a son. They seems to adore each other and more importantly, are happily married. Mason is too caring and loving son, while Cora has no parents left. We don’t really know much about her until the moment when out of the blue on a beach picnic, holding a knife meant to cut an apple for her son, she gets up and runs towards a young man who was enjoying the company of his wife or girlfriend. All what she does is jump on him with the sharp knife and stab his face and neck eight times until her husband in shock grabs her away from him. As he loses his life on the spot, and she confesses her crime, there is one question left to find out – if she knew nothing about this man, then what was her motive to commit an outrageous act of crime? There is, however, one fact we learn about Cora right from the beginning. Yes, she is happy, but she has insomnia. Well, we know a person who is fully satisfied with their life can’t take pills every night as the only way to fall asleep. And there is clearly something she is hiding not only from her husband, but from herself as well, she’s yet to discover. It was a moment on the beach, like a wave of unpleasant memories crashes her while she was swimming. It’s a moment when she becomes unpredictable. It was obvious that something sad connects her to the same place or to an event, and the music, the music that was playing when she attacks thea man, seemingly, for no reason. Detective Harry Ambrose portrayed by Bill Pullman is not sane himself. There are few facts you will learn about him that will more or less give you a certain degree of understanding why he is so obsessed with his new case. For the investigators though, it’s an excellent case to work on, since Cora already pleaded guilty and many more witnesses can confirm the same, the same case can be closed quickly with the final sentence she receives. But when Ambrose starts questioning Mason and a few witnesses, he realises that there is more to what really happened and decides to travel to the past of Cora Tannetti to find the real reason that triggered her mind to switch from a loving mother and wife to a cold-blooded murderer. 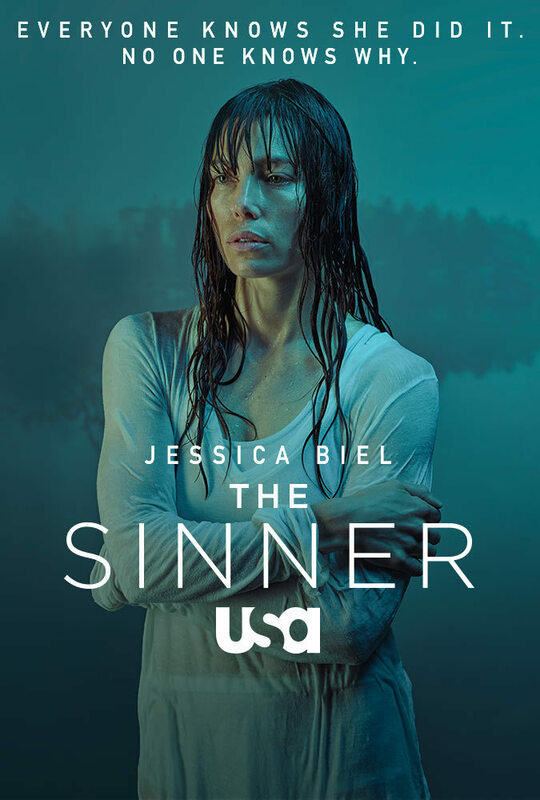 THE SINNER created by Derek Simonds is a dark, mysterious psycological thriller that I am sure a demanding part of the audience will enjoy watching. Jessica Biel as a troubled woman who might face a life sentence in prison is spellbinding. Her being the executive producer of the show brings her own perspective to Cora Tannetti which you will find truly astonishing. Bill Pullman as an obsessed detective is as convincing as he could get. It’s a part of his acting skills that I have not seen before. He delivers a refreshed performance of someone whose has more skeletons in the closet that any other police officer you find in the series. In conclusion, THE SINNER is a very promising series, a slow-paced one, which is perfect for this type of genre and dynamic at the same time. It takes enough time not to rush the events and slowly prepares us for a terrifying journey with the help of flashbacks, where we can eventually learn why Cora Tannetti became a murderer. There is of course a long journey ahead of us before THE SINNER concludes, but whatever it is, I am already excited as there is another show on TV I can watch while sitting on the edge of my seat.